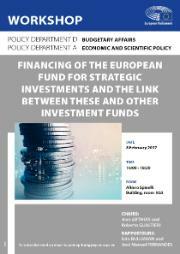 The European Fund for Strategic Investments (EFSI) has been in place for one and a half years now. Experience suggests that despite a clear quantitative success, certain things do not work the way that we had envisaged as Co-Legislator. The deficiencies are not so much linked to the specific provisions of the Regulation but to the way they have been interpreted or implemented on the ground. In order to respect in full the spirit and content of the EFSI Regulation, these implementation failures should be addressed. In July 2015, after intensive negotiations between European Commission, Council and Parliament, the EFSI Regulation entered into force. In these negotiations, the European Parliament insisted on a series of political and technical adjustments and managed to significantly improve the European Commission proposal. The European Parliament insisted on additionally of EFSI, achieved an additional one billion financing from unallocated margins, a powerful intermediary structure (National Promotional Banks), and support for small and medium enterprises. In September 2016, the European Commission presented an amending Regulation to the original EFSI Regulation of 2015 (EFSI 1.0), prolonging the instrument, as well as proposing changes on the content with an aim to augment its capacity and to address certain insufficiencies.